Garment #2 for the Pattern Stash Contest at Pattern Review. I can't remember how long this has been in my stash. I just started the vintage kick within the last six months so I've probably only had this pattern for that long. I really like the unique shape of this dress. It's simple but still different than what you see today. It's got the yoke with built in sleeves and is gathered at the bodice. I used a blue jersey knit from Denver Fabrics. The dress cost me $10.50 for fabric and I didn't need any other notions. This dress was so easy to make- I spent just a few hours on it. The only alteration I made was shortening it of course. I made a size 14 which fit me very well without alterations. I am very pleased with this dress. The belt makes it very flattering. I wore this to church then out for errands and grocery shopping. It was very comfortable. I will definitely use the pattern to make another dress or top. Your dress is very beautiful. I love your fabric choice. Looks comfy as well as stylish. Really cute - I can see lots of versatility in this pattern. Isn't it amazing how the style just fits right in? Looks great! Nice! It looks very modern, not like something from the 70s. And the colour is great, too. It is interesting how that 70's free modern look seems to still be the 'base' for modern design and style. IT looks so comfortable and darling. For me, though, since my living in 1955 this year, I bet now if I wore that style I would feel I was in my nightgown. It is funny how quickly we adjust to things even esthetics and without my undergarments and sinched in waists I feel to 'free' if that is the right word. 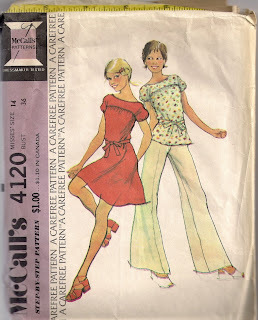 I am very glad to see you using old patterns I have boxes and boxes of vintage patterns that i have inherited. I am just beginning to sew this year as part of my housewifely duties. But I have patterns from the early 30's right on through to today. If I made half of these into actual clothes I could easily never wear the same thing twice! Lovely job and of course lovely blog. Great pattern, and a lovely choice of color. Love it! Wow, it's really so hip! I would love to find this in my size!